I know a little bit absolutely nothing about basketball, and a little bit absolutely nothing about NCAA spreads, so it makes a little bit of absolutely no sense that I am participating in a March madness spread this year. But I did it for a good reason! To be able to compete against my boyfriend and talk smack to him daily. And much to his delight, my extensive knowledge of the sport has me constantly texting him with incessant questions. "Jon, if Villanova is ranked #1 and Lafayette is ranked #16, why is Lafayette favored to win by 22 points?" "They definitely are not favored." "So my last game for today has a 0 point spread...what does that mean?" "Means there is no spread so each team has an equal opportunity to win. Cut and dry." "I downloaded an NCAA app! Damn, your girlfriend is sporty." And you know what else is madness? 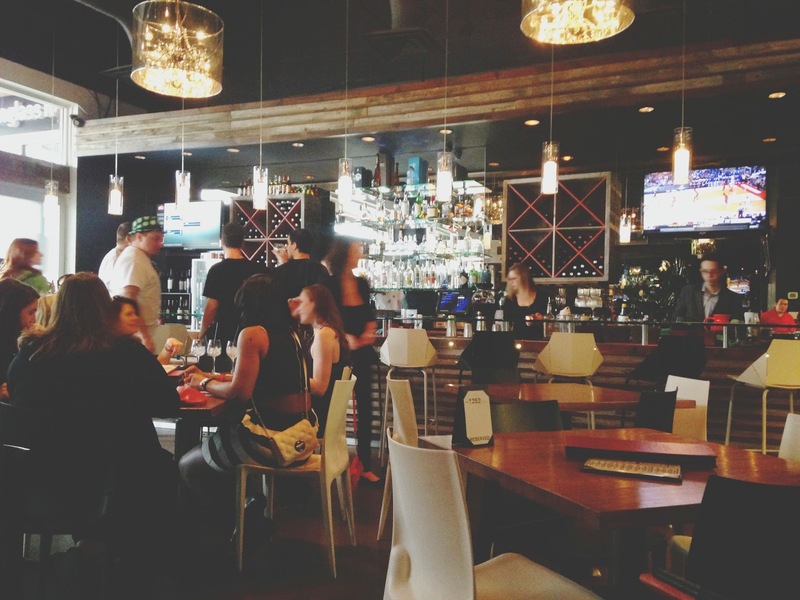 The awesome food and atmosphere at 1252 Tapas Bar in the Woodlands. I took my good friend Meredith there recently for her birthday, and we had a lovely time. The weather had previously been chilly, so I had reserved a table inside. When we got there, however, the weather was gorgeous (sounds like temperamental Houston these days, huh? ), so we asked if we could sit on the patio. There were no spots available, but they said we could sit inside until one opened up, which happened almost instantly! 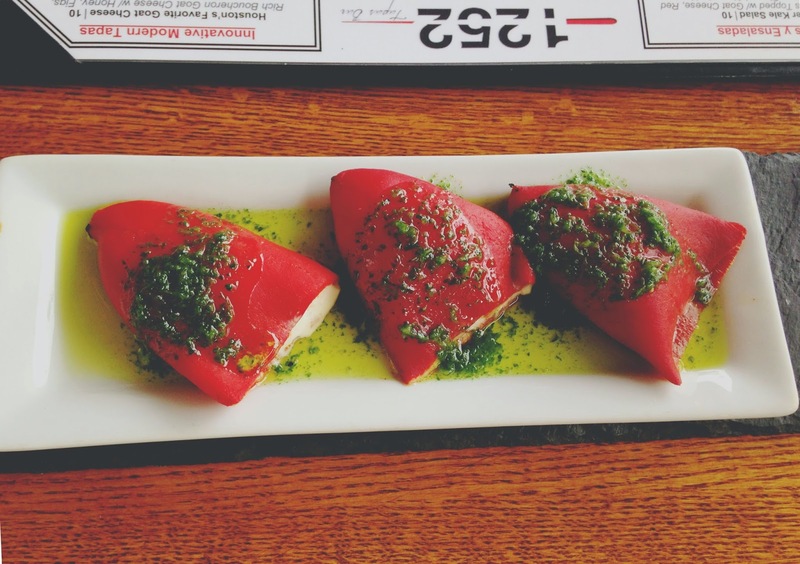 To start, we ordered the stuffed piquillo peppers. The sweet peppers were filled with fresh goat cheese, walnuts, and honey, and topped with a sort of subtle pesto. Y'all, these were awesome. The creamy goat cheese was light and decadent, and the crunch provided by the hidden walnuts was a real treat. These were a great way to start everything off. Next up, we ordered the Spanish grilled cheese without ham to make it vegetarian. 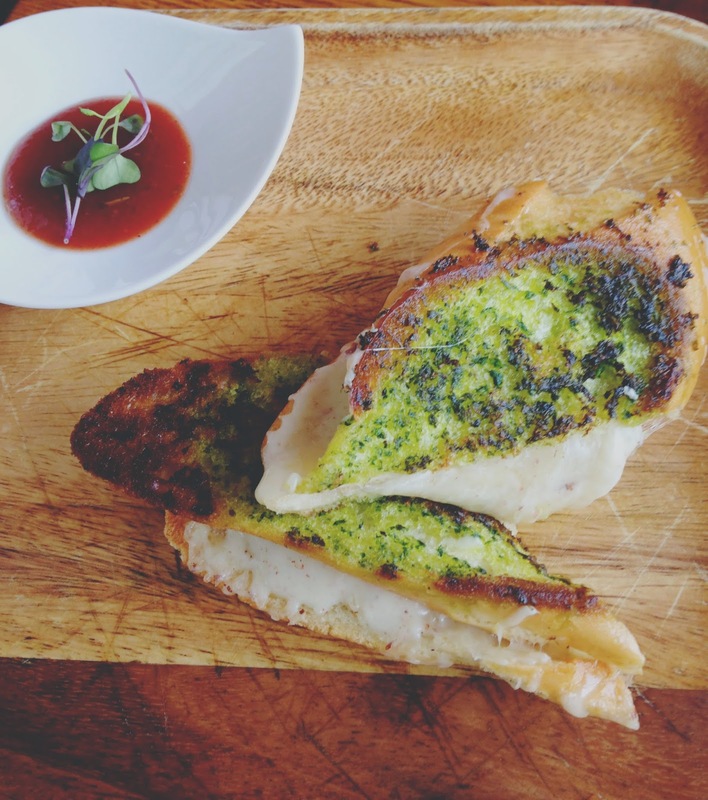 The grilled aged manchego cheese sammy was accompanied with a sweet quince sauce. We both agreed that while this wasn't the best grilled cheese ever, it was still a good one. The toasts were wonderfully buttered, crisp, and not at all soggy. And the generous offering of cheese was oozing with melted delight. Nothing really brought this grilled cheese to a new unique level, but I did enjoy it. 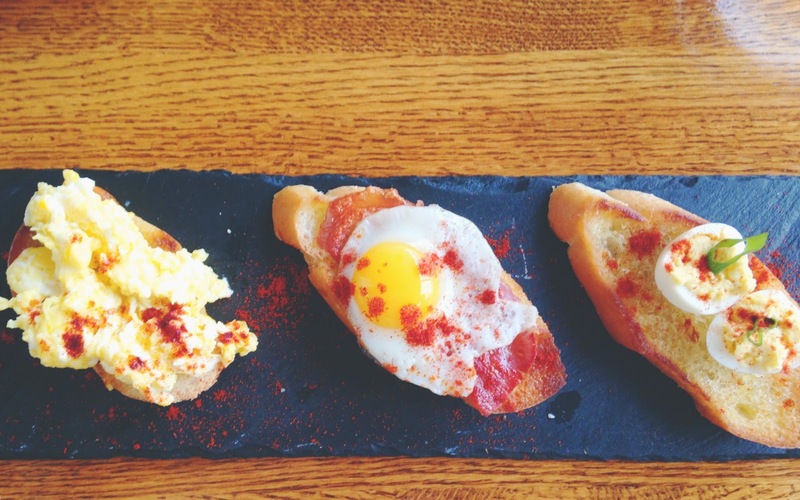 After the grilled cheese, we shared the tres huevos: quail eggs three ways - soft scrambled with goat cheese, fried with crispy jamon (ham), and truffle deviled atop little crostinis. For as pretty as the presentation was, this was probably the least impressive tapas dish we ordered. The scrambled eggs were nice and light, but they simply were just that - scrambled eggs on a piece of toast. I didn't try the fried egg and jamon, but Meredith wasn't blown away by it. And Lord knows I love me some truffled anything, but I couldn't really taste it in the deviled eggs. Just like the scrambled eggs, they were simply deviled eggs atop a piece of toast. Do not get me wrong, this dish was not bad by any stretch. It just lacked the creativity it seemed to promise. 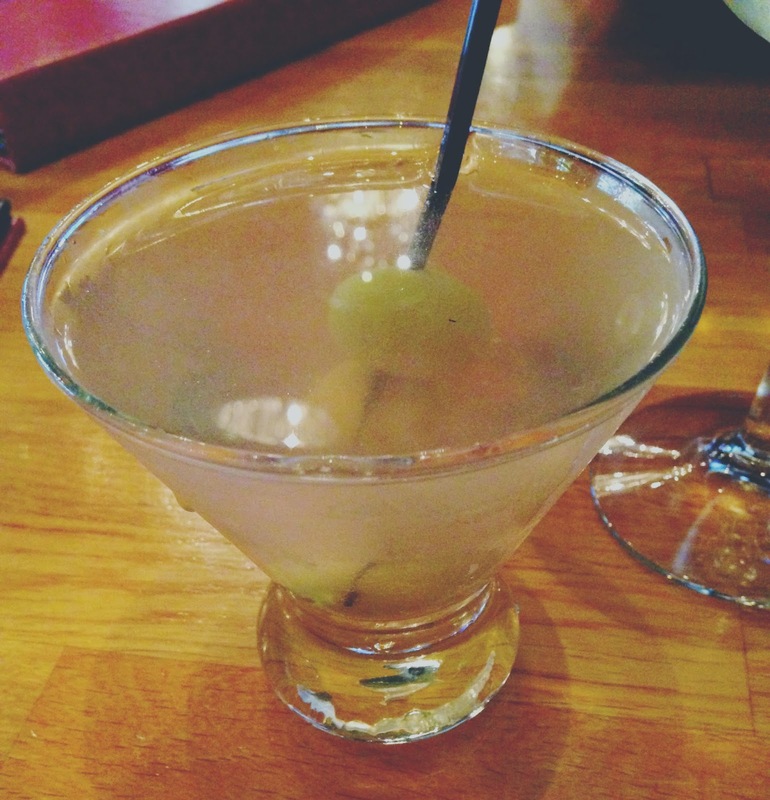 Fortunately, the next thing we ordered made my heart go pitter patter. 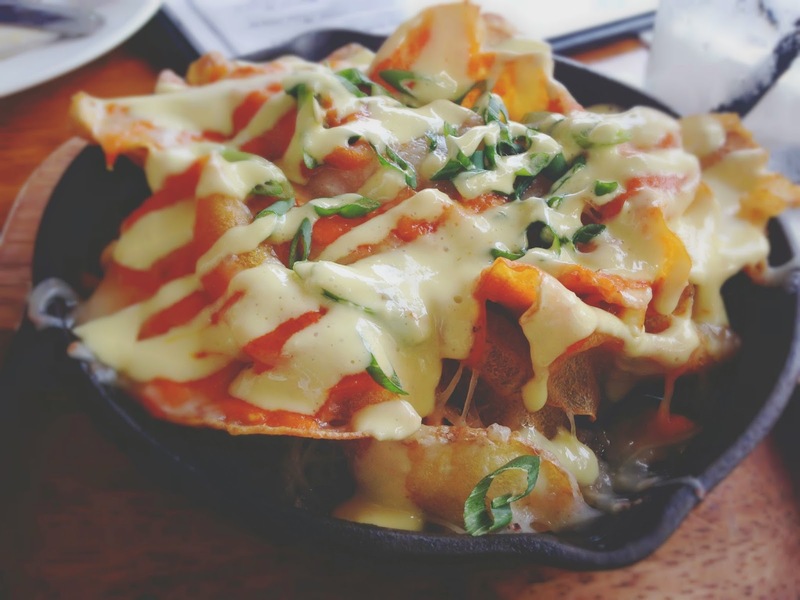 The truffle patatas fritas (sans bacon to make vegetarian) were o u t . o f . t h i s . w o r l d .
The dish consisted of thin potato crisps topped with tetilla cheese, chives, and truffle aioli. The potatoes were beautifully crispy, and the lemony, truffly, tart, savory cheese/aioli combo was absolutely sinful. This excellent dish was far and away my favorite thing we ordered. 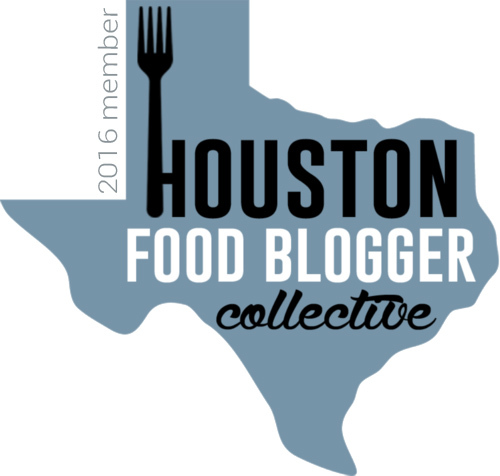 Because we couldn't stop at four, we ordered a fifth plate, #duh, which was the beautiful dish with the proud title, "Houston's Favorite Goat Cheese." 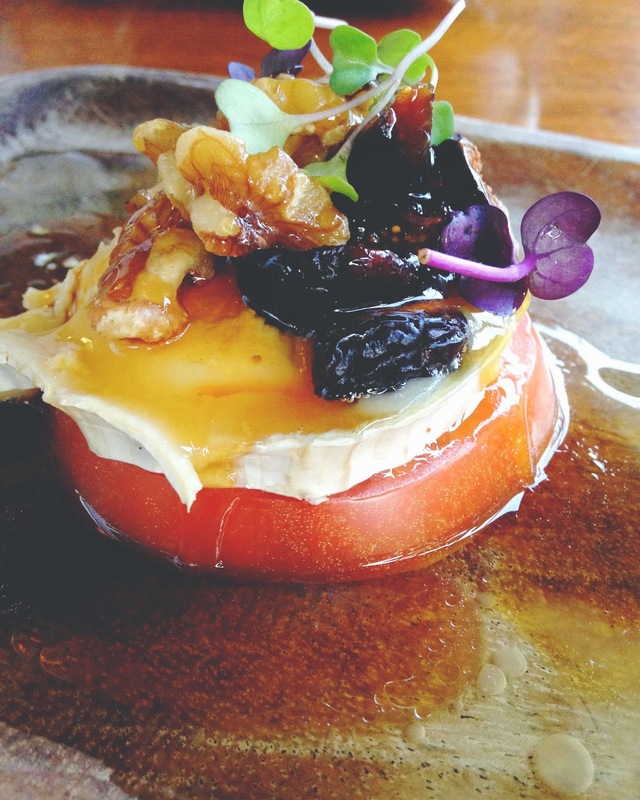 Boucheron goat cheese with honey, figs, walnuts, and apple cider perched elegantly atop a plump, ripe slice of tomato. The rich, creamy, heaping slab of goat cheese reminded me of a velvety brie. The combination of the salty, crunchy walnuts, the sweet, syrupy honey, and the candy-like figs made this an interesting, eclectic, and thoroughly enjoyable dish. This was Meredith's favorite thing we ate, and I was definitely a fan. And because it was Meredith's birthday, and there were three desserts on the menu, gosh darnit if we didn't sample all three! 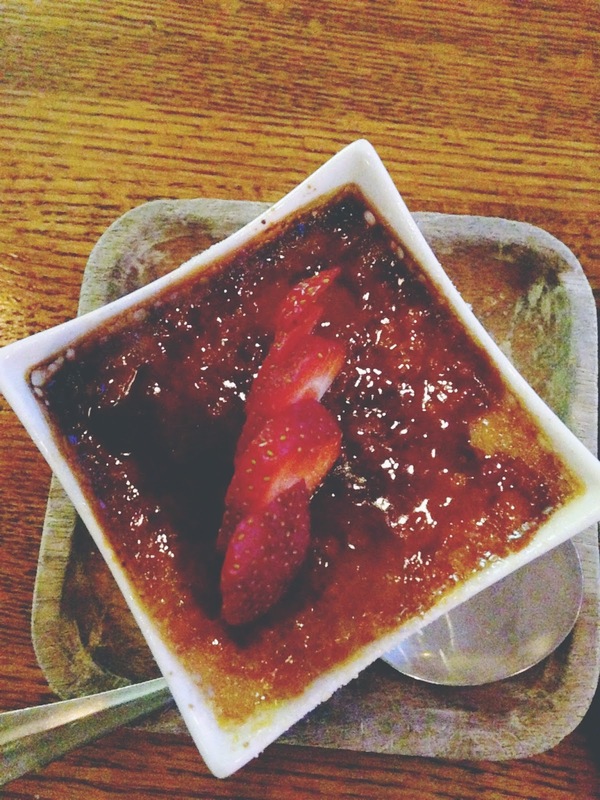 I was not a wowed by the crema Catalana: Spanish custard-style crème brûlée topped with caramelized sugar and fresh strawberries. While I give 1252 an A for Presentation once again, I had a bit of a weird aftertaste in my mouth after eating it. But then again, I'm never really one to order crème brûlée. 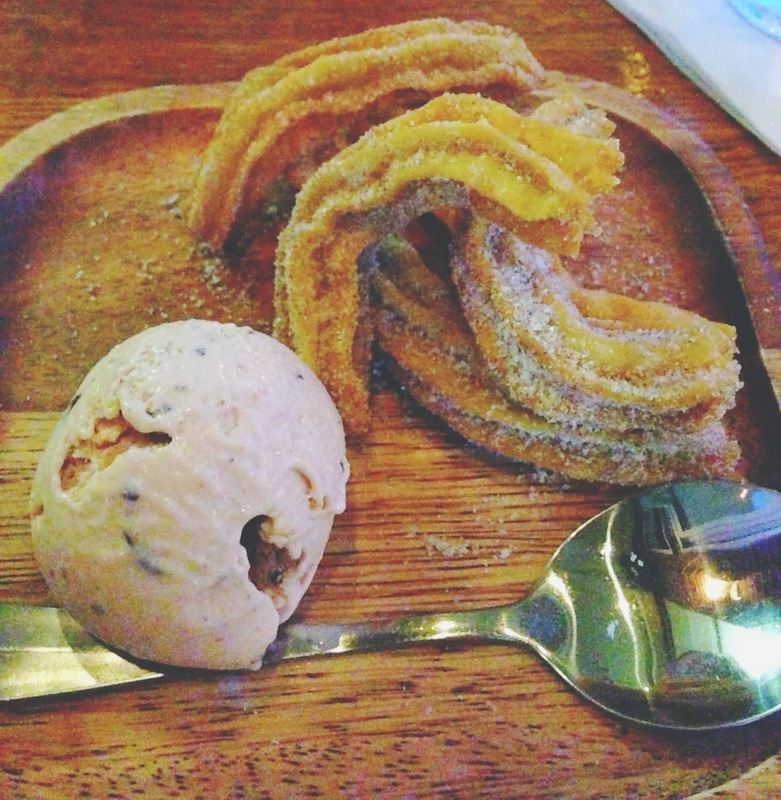 I was however a HUGE fan of the churros, which were served with homemade strawberry chocolate chunk ice cream. 1252 wasn't trying to re-invent the wheel with this one, and they certainly didn't have to. Lightly crisped on the outside, warm and fluffy on the inside, the cinnamon-heavy churros were divine. And that strawberry chocolate chunk ice cream was a wonderful, refreshing companion. This was definitely my favorite of the desserts. 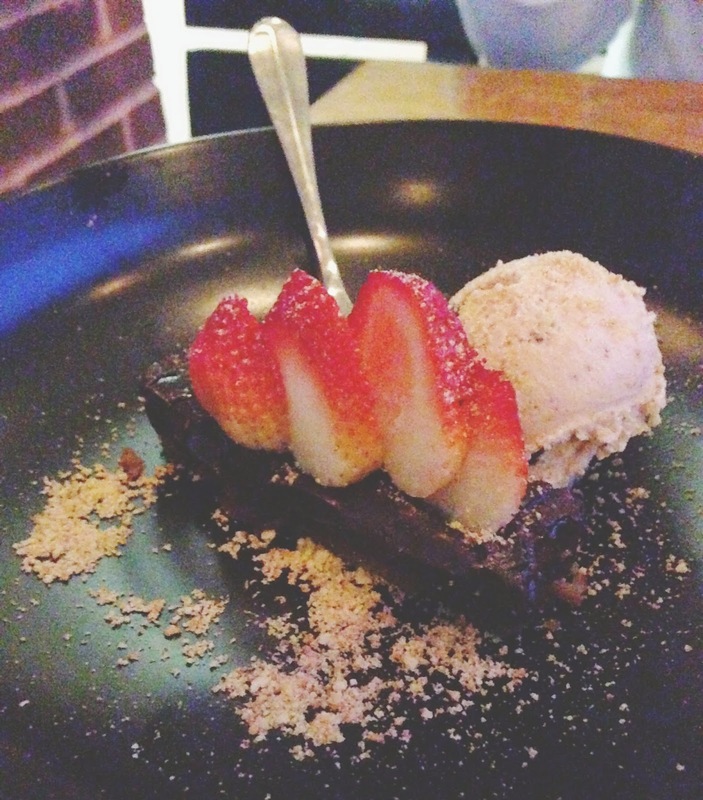 Lastly, the chocolate tart with a vanilla wafer crust was also very good. Dusted in powdered sugar and vanilla wafer crumbles, the cake was super rich. The tiny portion was spot on for such a large-tasting dessert. Paired once again with that awesome ice cream, it took the edge off of what might be a potentially-too-bitter dessert, to create something lovely and enjoyable. Even though it took me an hour and 10 minutes to get out there (Seriously, is that Dallas-->Woodlands-->Houston bullet train ever happening? Can we get a kickstarter fund going for that? ), 1252 Tapas Bar was well worth the drive. 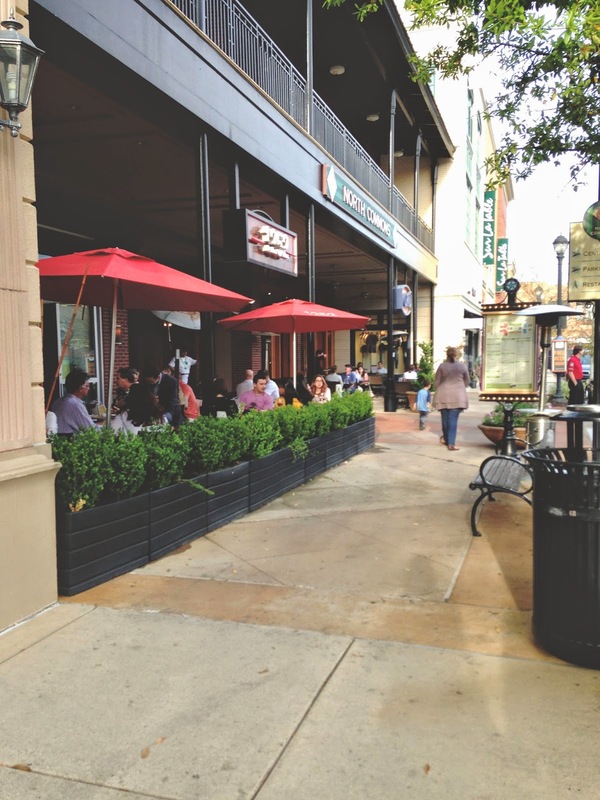 Located in the pristine, buzzing (albeit commercialized) Market Street area, it's quite the happening spot. The prices are not outrageous, though I'm sure they have the potential to get a little out of hand. Luckily for us, 1252 was celebrating their 5th anniversary that night, so they had some great food and drink specials going on! 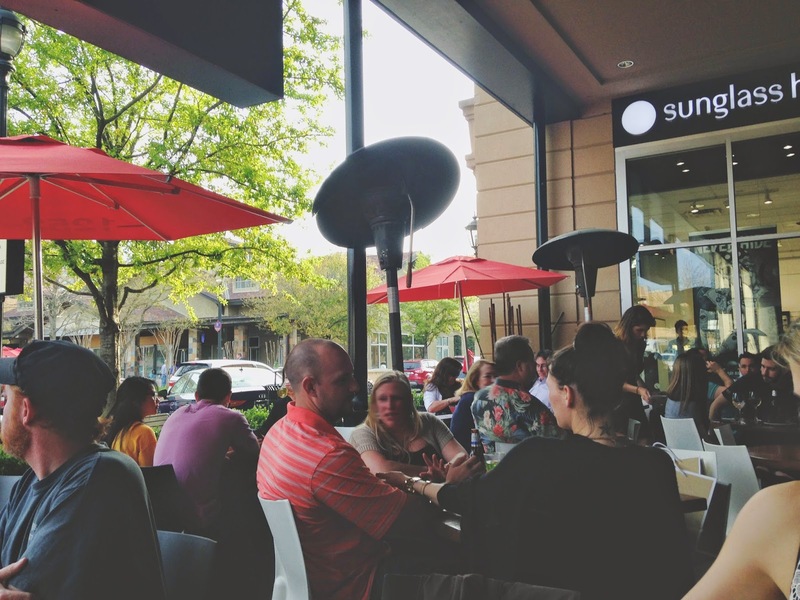 Regardless, the food is carefully prepared, thoughtful, and thoroughly enjoyable. It for sure gets the Kim Stamp of Approval!